The Torin T26801 Engine Stand sports the signature Torin Jack solid steel black frame to amply support up to 1.5 tons of engine weight. Even with 1.5 tons of engine weight, this engine stand still allows users to handily haul engines and cargo with its front swivel castors. The Torin stand has a large and heavy chrome head perfect for engine and big block displays. The T26801 has dimensions of 33.9 x 15.8 x 6.3 inches,with four adjustable arms and a 360 degree rotation capability that make this engine stand quite flexible for finding the best possible angles to position your engine. It weighs at about 76.8 lbs, allowing its frame to handle virtually every car engine in the market today, while still giving the T26801 the right sturdiness for movement and engine handling. The frame and weight of the T26801 also gives it the proper stability for engine work. The T26801 is also foldable, making it ideal for easy storage and portability. More importantly for buyers who put a premium on affordability without compromising value, the T26801 is priced at roughly $100, with free shipping from Amazon.com. This price tag makes the T26801 significantly more affordable compared to engine stands by other brands that have similar specifications and capacity, with some priced at $120 up to more than $300. Affordability and handling capability are the first things that come to mind with the Torin T26801 engine stand. If you are looking for the engine stand that gives the best bang for your buck, the T26801 stands toe to toe with its competitors boasting its solid build and durable features. 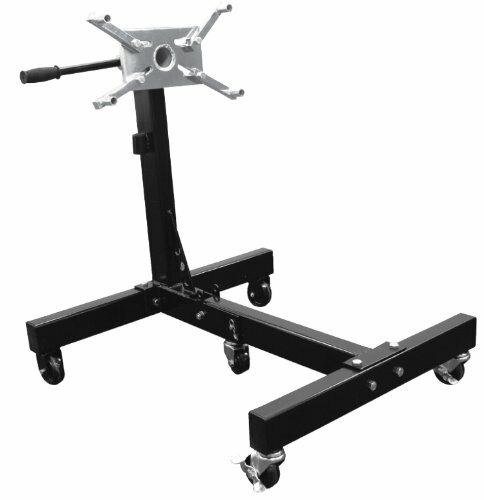 In today’s market where a no-nonsense approach in equipment care and handling is of utmost importance, the T26801 engine stand is a standout tool for businesses and casual users alike. For product additional inquiries user ratings and reviews on the T26801, you may check out Northern Tool + Equipment at NorthernTool.com and The Garage Journal at GarageJournal.com. The Torin T26801 scores a good 3.9 out of 5 stars at Amazon.com with 7 reviews. Three of the seven reviews gave the T26801 a solid 5 of 5 stars, highlighting its price, easy assembly, handling and durability. Other ratings include one 4-star review, two 3-star reviews and one 2-star reviews. Other reviewers highlighted the lack of hardware in the T26801, simplistic design, and low quality welds for their lower rated review of the T26801, while still applauding its affordability, portability and general design. Overall, customers seem satisfied with the quality and relatively low price that Torin Jack offers for its T26801 engine stand.